After operating as the Portuguese restaurant Quinta for a couple years, the menu and space have been revamped and is now home to Essen (@essen_toronto), a family-style eatery inspired by Jewish cuisine. Located on the trendy Dundas West strip, the space is largely the same as its predecessor. 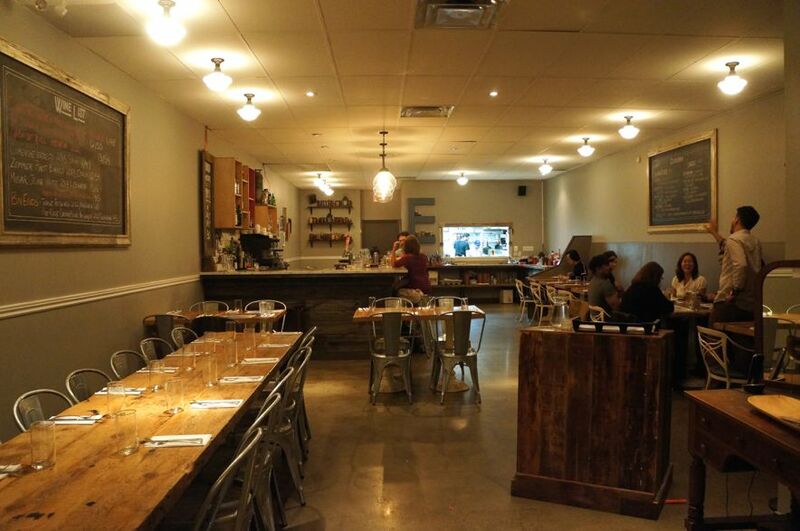 It underwent a quick renovation and was reopened with the new concept which is the brainchild of executive chef and owner Leor Zimerman (who also owned Quinta). There are a few differences though – for example, the Bar Mitzvah photo wall featuring goofy photos from the big day. Bring yours in to hang on the wall, and get a free meal! With the recent opening of Fat Pasha, Schmaltz Appetizing and People’s Eatery, Jewish fare seems to be the new hot trend. And I’m not complaining. The food is fantastic! While Essen isn’t kosher, they adhere to the major rules like no pork or shellfish and they don’t mix meat and dairy. “There’s this distinct aspect of growing up around a Jewish dinner table that I wanted to capture and share with the city,” said Zimerman. “For me, it’s more of a coincidence that it’s on trend, because this is the food I grew up eating, and I’m excited to put my training behind it, in a restaurant setting, with all the experiences I’ve had with my family”. 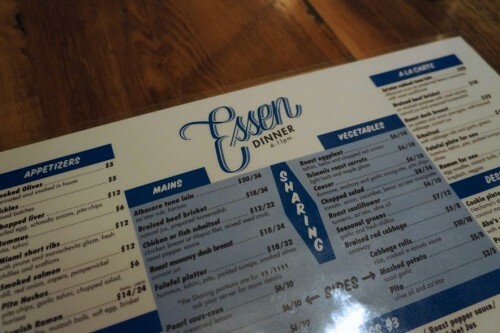 Essen’s extensive menu is broken down into family-style dishes and a la carte options. I recommend coming with a large group to maximize the number of dishes you can try. 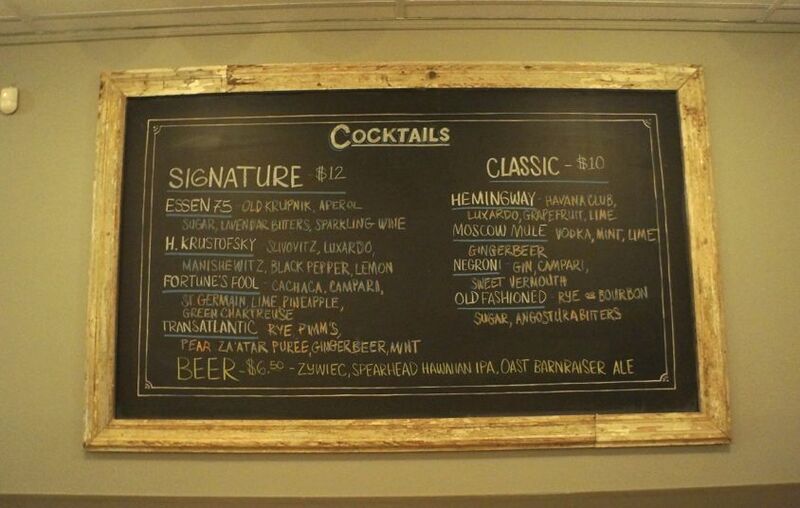 Otherwise you’ll have a tough time narrowing down what to order – everything sounds amazing! 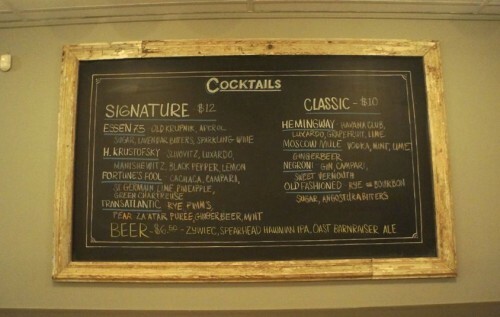 As far as beverages go, Essen offers several beers and a handful of signature and classic cocktails. 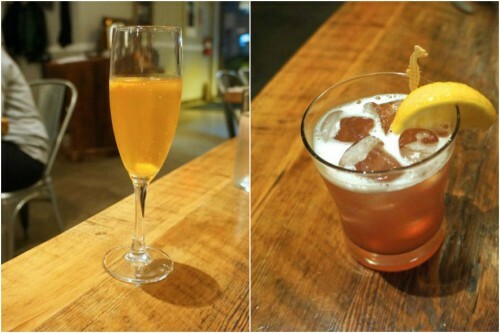 We tried the Essen 75 – Old Krupnik, Aperol, sugar, lavender bitters & sparkling wine ($12) and the H. Krustofsky – Slivovitz, Luxardo, Manischewitz, black pepper & lemon ($12). 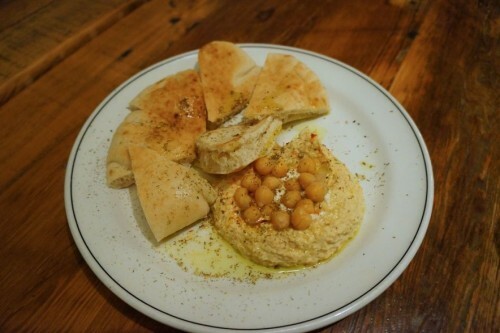 Our meal began with an order of Hummus – pita & tahini ($6). Served with warm pitas, we licked every bit of it clean off the plate. So yeah, we liked it! We particularly enjoyed the addition of whole chickpeas which added a nice chunky texture to it. Another appetizer we ordered was the Miami Short Ribs – with prune and Manischewitz glaze, fresh chillies and scallions ($12) . They were cooked well – not too chewy which can often be the case. 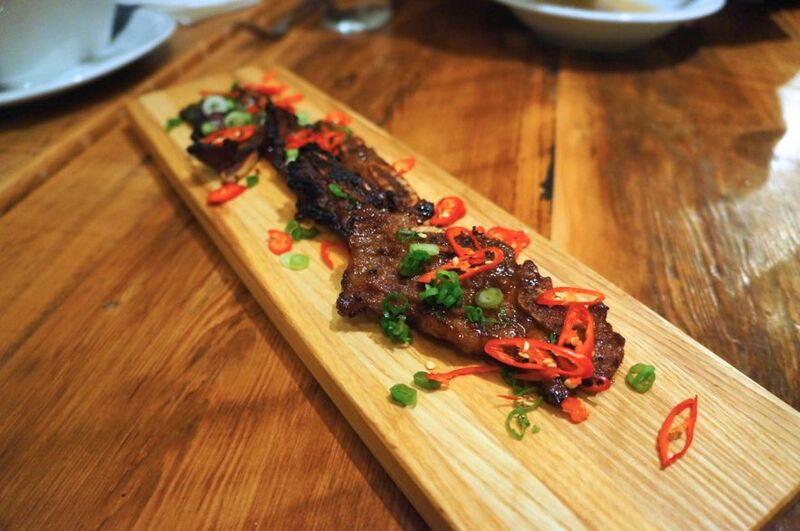 I loved the sweet Manischewitz (Kosher wine) glaze and the chilli garnishes gave the ribs a nice kick. 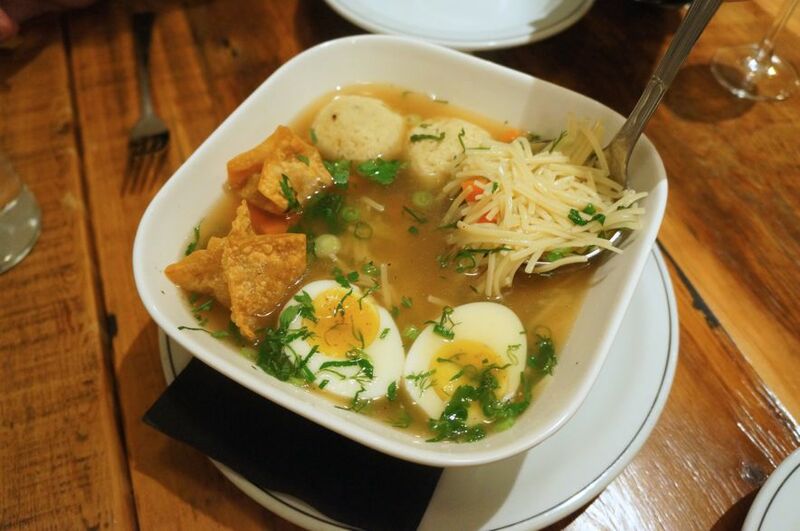 Up next was the Jewish Ramen – egg noodles, matzoh balls, soft egg, brisket kreplach, veggies ($14 small/$24 large). After it was placed in front of us, it took every ounce of willpower to not dig into it before snapping a few photos – it smelled incredible! Mike said the smell reminded him of a high holiday (these occasions aren’t complete without a bowl of chicken soup with matzoh balls). The delicious chicken broth was filled with a generous amount of thin egg noodles (like the ones found in chicken noodle soup) and topped with a soft boiled egg. The “ramen” also came with two tasty brisket kreplachs which were basically deep fried wontons. They definitely left me wanting more! 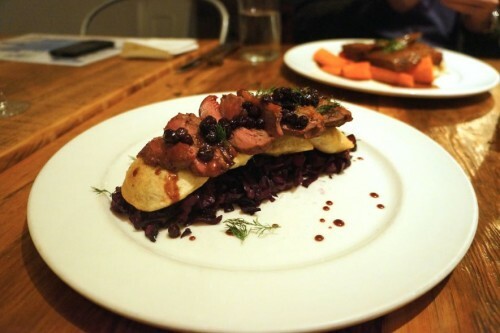 From the a la carte section of the menu, I ordered the Roast Duck Breast – on potato and onion perogies, with braised cabbage, currant jus ($22). This dish came highly recommended by Chef Leor and after one bite, you’ll understand why. The duck breast was perfectly seasoned and the sweet currants complemented it wonderfully. While the duck was the star of the dish, the accompanying perogies and braised cabbage were just as delicious. 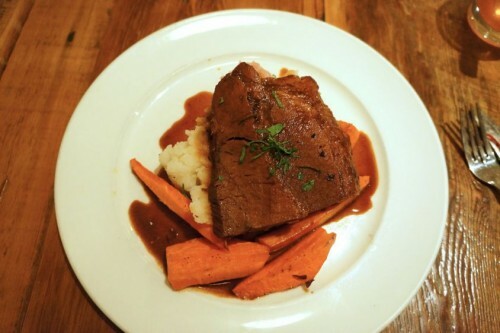 Mike decided to go with the Braised Beef Brisket – on mashed potatoes with roast carrots, natural jus and prepared horseradish ($18) for his entree. It isn’t a fancy dish by any means but boy is this ever comforting. It’s such a great winter dish that will certainly hit the spot. The tender brisket was quite sizeable in portion and was served with house made beet horseradish which really gave the brisket an extra oomph. 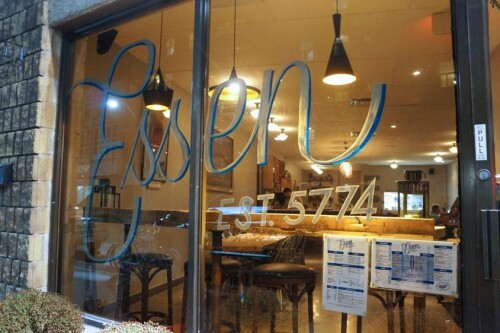 Essen offers three desserts and we had the opportunity to try them all. 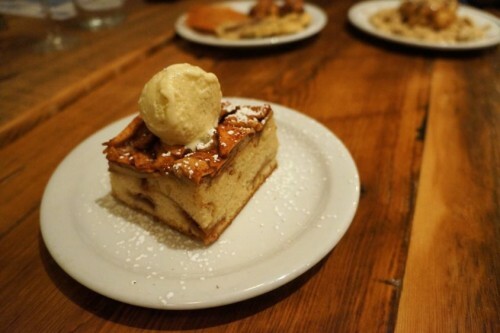 The first one I dug into was Aba’s Apple Cake – with vanilla ice cream ($6). A moist cake base with slices of apple, topped with a scoop of cold ice cream. I’ve eaten a lot of apple cake and this one was definitely a winner. Up next was the Puff Daddy – deep fried puff pastry with pomegranate molasses and halva ($5). 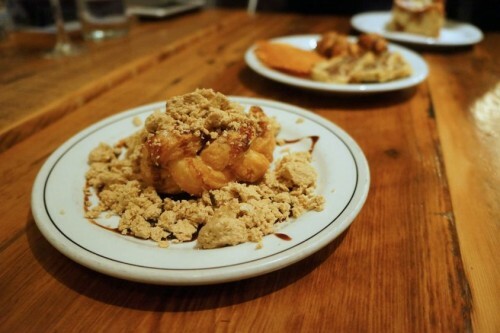 The fried puff pastry had a great texture and we enjoyed the addition of all the halva (they were VERY generous with the halva!). 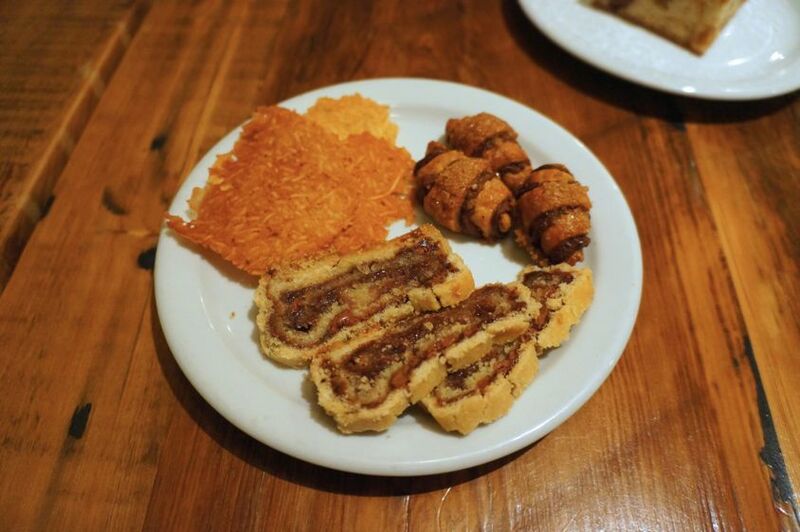 We were stuffed silly by this point so we took the Cookie Plate – Nechama’s strudel, rugelach, coconut macaroons ($6) to go. We ate them the next day and they held up surprisingly well. Each of the components were really delicious. Mike’s favourite was the strudel while mine was the rugelach. As for the macaroons, I’m not usually a fan of coconut but I found these to be incredibly addictive. I’d order the cookie plate again in a heartbeat. Mike and I had a wonderful time at Essen. Mike found it very nostalgic as these dishes reminded him of his childhood. It really played on his sense of culture and really hit home for him. While I don’t come from a Jewish background, I still really enjoyed the food. You’ll definitely be seeing me back here. 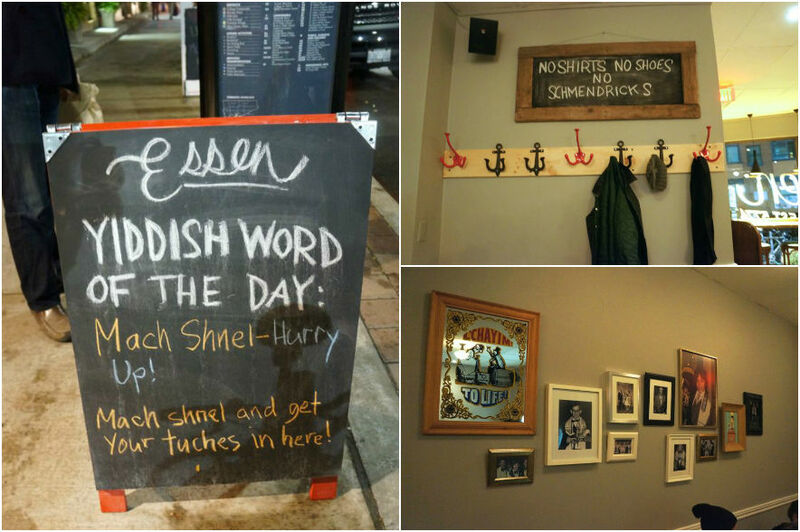 Essen offers brunch on the weekends and that shak shuka and challa french toast have my name written all over ’em! I started this blog to share my dining adventures, both good and bad. Enjoy!